We’re all on a quest to foster creativity, boost focus, and amp up productivity during our working hours. While tweaking personal habits can certainly help with all the above, sometimes the answer lies not necessarily what’s in us, but what surrounds us. Given how much time we spend working, it’s important to make home offices as comfortable, thoughtful, and intentional as possible. Looking to revamp your space to boost your creativity? Below you’ll find expert-provided home office décor ideas that’ll help you do just that. If your desk faces a solid wall, then aim to make that wall as stimulating as possible, says interior designer John McClain. Infusing your focal wall with more personality and function is a great way to liven up your space -- and energize your brain. You’ve got a lot of options here, including wallpaper, large paintings, a mural, a gallery wall, tapestries, or functional shelves, anything that is of visual interest to you. If redesigning a blank wall feels too overwhelming, reach for a paintbrush instead. Walker says, “It has been scientifically proven that color can drastically improve one’s mood, enhance creativity, and increase productivity.” Want to make sure you choose the right hue? Colors that are known to boost productivity include shades of blue, yellow, and green. One specific area to focus on is your desk, the intimate space where you’ll spend much of your working hours. A striking table lamp that speaks to your design preferences will have mood-boosting effects, incorporate a burst of your own style, and provide a better lighting situation (poor lighting can result in headaches and inability to focus). If you’re struggling with what kind of lamp to choose, McClain suggests opting for one that contrasts with your desk. For example, an antique brass lamp on a traditional oak desk or a modern glass lamp on a midcentury desk. If you have a desk job, your home office chair is only second to your bed in terms of where you will spend the majority of your time, so it’s important to invest in the right one.The market is blessed with numerous ergonomic and functional options that don’t have that stuffy “typical desk chair” vibe, so there’s really no excuse to swap out a subpar chair for one that’s better suited to your style and comfort needs. Whether traditional or not, just make sure your office chair is comfortable enough for your body to sit in for long stretches. 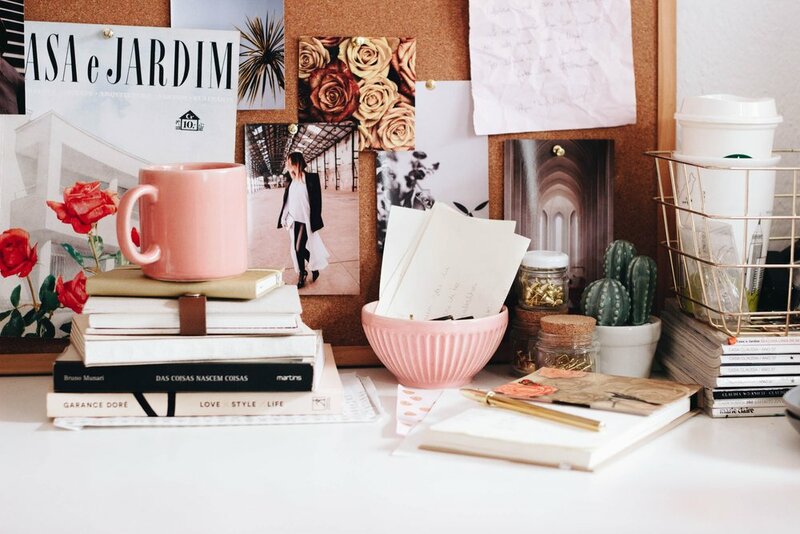 Not only are vision or mood boards deeply motivating, they also add creative flair to your home office space. If you decide to create one, let go of trying to get it perfect and just have fun with the project. Walker says, “In the past, I've turned boards into literal pieces of art by strategically placing words and photos. The ‘extra’ factor comes from framing the piece with a decorative frame that matches the rest of the decor of the room.,but a cork board with images and quotes that inspire you works just as well. Not only do plants help improve the air quality of indoor spaces — NASA even proved it in their own study — they’ve also been found to improve focus,boost productivity,, reduce stress levels, and make you feel happier. And if your home office is without windows, incorporating house plants becomes even more important. Clutter happens, and very few people can be perfectly tidy all the time. You can improve overall organization in your home office, though, by utilizing closed storage options and ensuring every item has its place. Other options for storage include bins, baskets, built-ins, free-standing shelves, and trays for loose objects. When an item has a home, you feel less stressed because you know where everything is, and you also waste less time scrambling to find it. Choose colors that make you happy to be at work, be kind to your back with a great chair, keep clutter at bay, make a new plant friend, and incorporate décor elements that speak to your personal aesthetic. The result is that you’ll enjoy spending time in your home office, which breeds productivity, creativity, and joy. Want to learn other tricks for boosting your creative potential? Check out Skillshare’s creativity classes for more ways to stay innovative and productive over the long term.